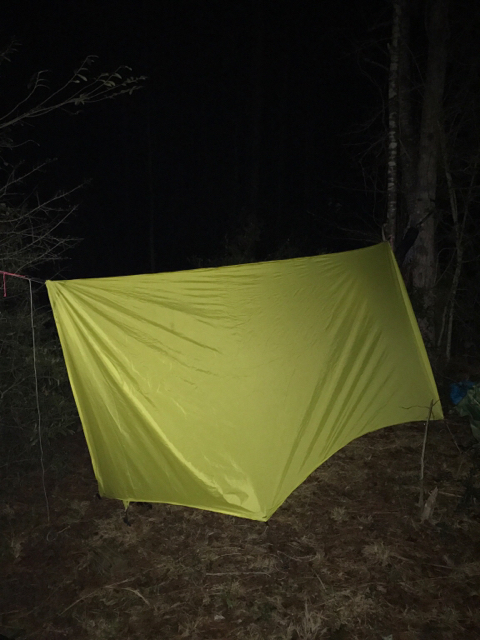 Well, dang... thought I had my underquilt plans in hand, now this new wrinkle comes along! Looking forward to hearing more about how this style works in the field. And thanks for the history lesson...had heard Speer products mentioned but now I can appreciate how groundbreaking the Snugfit was. I'm interested in hearing about a field test with the costco quilt. It has some obvious limitations, being thin and sewn through. However, I'm sitting on two of them right now, so if it works, I'm interested in doing the same. Please post your results when you get around to it. With your particular project, because of the limited amount of shock cord, probably needs to be a bit shorter to make it snug up. If it doesn't hug against an empty hammock, it needs to be shorter/tighter. Same is true if you are laying in the hammock and can feel any air pockets underneath anywhere. It should be 100% flush with the hammock. One thing i'm doing with my quilt is tying a 12" section of regular cord onto the ring, then using that to tie onto the hammock. That way if it needs to be a bit tighter or looser, i just retie the attachment cord. I use this to switch between my outdoor WBBB and my indoor Brazilian hammock which is much longer. Might as well put the quilt to good use when inside too! As such a slightly shorter clew is better? 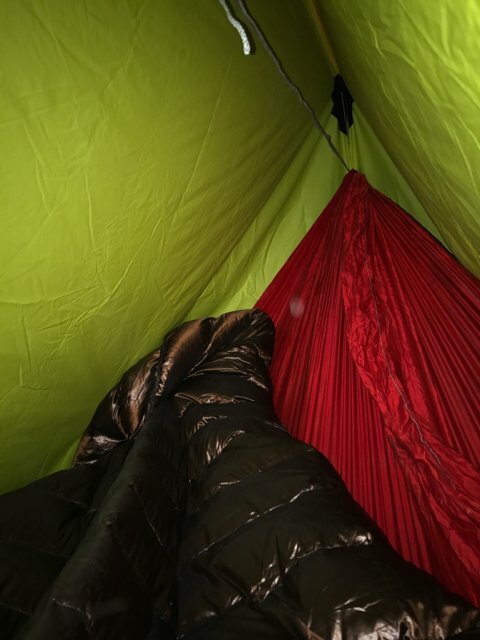 Then you can lengthen it with the cord to fit your various hammocks. Hung in it a little bit this afternoon and the fit is great. 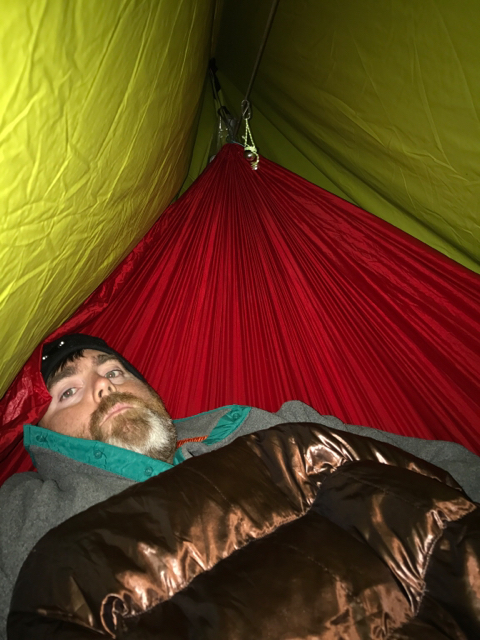 12 ft Hammock,double layer, 7 foot UQ, that makes my nettles 25 inches. I actually made them 20 not 21 like I originally said. It's a little short on the sides but my top quilt will compensate. Also working on a sil-poly cover for the bottom of the UQ really just for keeping the breeze out, making it removable. 39 degrees and I'm toasty. Winds blowing about 5 miles from the northeast but everything is holding true. I'll keep you posted in the morning. First off, awesome work on this to all. I don't know how I missed this thread for a month. I've got an upcoming UQ project and may try this. Even if it doesn't pan out, it doesn't look like it would be terribly hard to convert it back to a more traditional UQ. I was going to suggest something like bigryn0 did but I'm shooting for ultralight. In my mind (and this goes for more traditional UQ suspensions too) we want to figure out the maximum amount of stretch we need and use only that much shock cord and no more. The rest should be something like the smallest Zline or maybe spectra or dacron braid fishing line. I'm wondering if we could replace the decorative knot with a triangle of wide waistband elastic and use static lines for the nettles. Similarly, we could potentially replace the descender ring with a loop of thicker shock cord maybe. Or perhaps latex tubing. I'm not sure if either of these would distribute the tension properly. Alternately we could work from the other end and use a strip of spandex type material at the UQ and then a static clew to minimize the amount of relatively heavy spandex. I don't really know if it would be any lighter. The night went great. No cold spots except my feet, but I chocking that up to my TQ. And have fixed that issue. It started raining about 445am and I was dry, and toasty. Sticking with the "static" clew, shock cord setup. Tension is good and I can still move it around it I need to. We're using 1/16" featherweight shock cord on these (so far). I don't think you're going to save any weight at all by trying to substitute some other kind of cordage for a portion of it. Mechanically, it's the stretchiness that makes this design work. If you take that out, the design fails. You actually need more stretch than necessary for this design to work and not risk damaging the quilt. 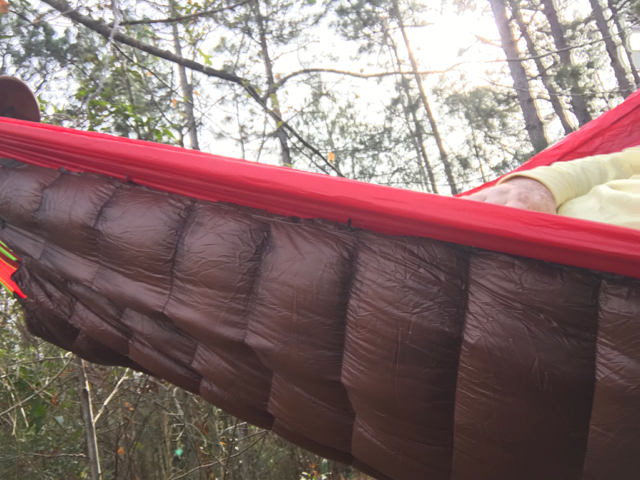 If you max out the stretch of the quilt suspension when you get in the hammock, you instantly go from putting ~2lbs of pressure on the quilt to putting your entire body weight in it. Recipe for disaster. So, there is a reason why the nettles should not be static lines. You absolutely do not need to use a descender ring. I'm using a keyring. That's more than adequate for anything your quilt needs to do. Last edited by leiavoia; 12-31-2016 at 14:42. Last edited by Intimidator; 01-02-2017 at 10:44.
www.RipstopbytheRoll.com| "The Best Fabrics on Earth. Guaranteed."